After all “Tomorrow’s Yesterday” is …. Today! Is anyone listening anymore? Does anyone care, - lost in this modern techno infatuated, cyber world....? Well, they better if they can begin to appreciate what the Great Generation that won WWII gave to us. As the pendulum swings what is this generation passing on to America's future generations? What's the message & who are the leaders of this generation? Medicated up & dumbed down... Welcome to the new Millennia! The RestlessSouls Marino assembled for this album include Nashville greats Danny Eyer & Jimmy Heffernan whose resumes include performances from The Tonight Show to The Grand Ole Opry & touring with the likes of Brad Paisley to Chuck Berry as well as Bluesman Mike Dugan who was voted Bluesman of the year by Show Business News NYC after that award was previously given to the likes of Mike Bloomfield & Eric Clapton. Singers include outstanding performances featuring the backing of Rachel Conrad, Jenn McCracken, Mike Volpe & Bobby Campanell. A young man named Jon Bon Jovi once opened for Bobby Campanell & the Shakes & named him an early influence. You can read the outstanding reviews & industry feedback of Marino’s work on his website at MikeTMarino.com or RestlessSoul.com – too much to list here, but rest assured fans of excellent songwriting mixed with vintage Rock/Americana sprinkled with Folk & Blues will be delighted with this album. Nostalgia is a thrust to relive or, once again, feel a fleeting happiness spurred on by a time or place in one’s life. For Americana singer-songwriter Mike T. Marino, processing nostalgia has been a way to make sense of the world both externally, epitomized by the drastically changing American landscape, and internally, in terms of longing for a feeling of warmth and belonging that slipped through his fingers as a child. 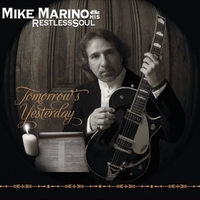 Mike Marino & His RestlessSoul’s previous album “Out of the Darkness” was a career milestone of darkly cathartic Americana that would eerily foretell tragedy in his personal life. Thankfully, he emerged wiser from the time with some fire in his belly. His latest album, Tomorrow's Yesterday, is a masterful collection of heartland rock with an in-the-moment immediacy. Though musically influenced initially by the British Invasion, Mike’s songwriting roots are firmly planted in the American Heartland. His journey through the roots of American music started with his love of the Blues and then migrated into the Folk/Country Influenced Rock of the California West Coast Sound. Mike has currently released four acclaimed albums of roots rock that alchemize the optimum balance of folk, blues, and alt country. His work shifts between literal and metaphorical perspectives as it chronicles the American countryside getting paved over by the modern industrial complex. Mike’s music furthers the compassionately critical Americana dialogue pioneered by artists such as The Byrds, Buffalo Springfield, The Flying Burrito Brothers, CSN&Y, The Eagles, and The Band. Previous entries in his catalog have been praised by National Reviewer Keith “Muzikman” Hannaleck and the esteemed UK publication Blues Matters. He’s been the featured artist pick on Philly’s WXPN 88.5 FM, received the ASCAP Plus Emerging Artist Award for extended plays, and placed as a semi-Finalist in both the Great American Songwriting Contest and The Dallas Songwriting Competition. His song "Edge of Dawn" won a contract with the CBC (Canadian Broadcasting Corp) to be used on an episode of the acclaimed series Revision Quest. And his song "Twenty Too Late” (a tribute to Stephen Stills & the Folk Rock migration from Greenwich Village to the Sunset Strip) was included on Volume 38 of The Acoustic Rainbow (Poetman Records) alongside such artists as Judy Collins, Stephen Stills and Vince Gill. Mike spent his formative years growing up on a small South Jersey farm. The quaintness of the community, and the purity of the environs made an indelible impact on him as a person and as an artist. “I was born a Shadow Boomer in 1962, on the cusp of two worlds, the progressive 1960s and the farm life that predated that. I watched a lot of that life erode away over the years,” he shares. Tomorrow’s Yesterday conjures the cool pastoral musings of singer-songwriters like Mark Knopfler, Tom Petty, and recent releases by Bob Dylan. Throughout the album there is a paternal beauty to Mike’s vocals, his melodies are sweet and sage, and each vulnerable lyric feels hard fought. The 12-track album opens with the longing tones of a lonesome pedal steel. The track is “Sarah Don’t Leave Me,” and it’s a dreamy folk-rock song mirroring the protagonist’s search and desire to find solid emotional ground. Mike addresses the literal and metaphorical fallout from the erosion of that bucolic American visage on the rustic and reflective “My Old Town” and on “No Stone Unturned.” On the latter track he address this loss of innocence from a place of agency, with a brawny dose of moody bluesy rock n’ roll. The album concludes with the graceful “Lonely Road.” There is a melancholy quality that permeates this ballad, but the lyrics point to the dawn after the night. “It sounds lonely and sad, but it’s about being on that holy ground on the other side of bad times. There is a positive message there, you just have to listen closely,” he assures. Tomorrow’s Yesterday was tracked at Forge Recording with Mike sharing production duties with Ron DiSilvestro. It features a handpicked selection of all-star players such as Nashville greats Jimmy Heffernan and Danny Eyer, along with Carlo Dalessandro, and nationally-recognized bluesman Mike Dugan from Mike Dugan & the Blues Mission. Grammy winner Phil Nicolo (Bob Dylan, Billy Joel, The Hooters) mixed the album, and multi-Grammy winner Richard Dodd (George Harrison, The Traveling Wilburys, Tom Petty, The Jayhawks) mastered it.